The new government’s priorities should be to restore the rule of law, redress miscarriages of justice and bring about reforms to our public institutions. 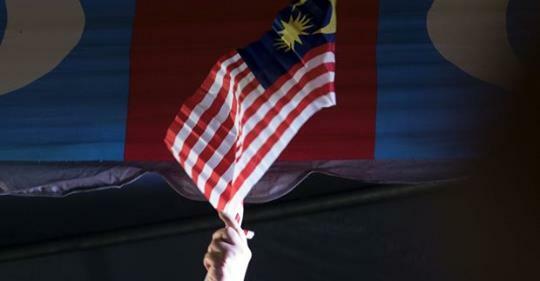 ON May 10, Malaysians woke up to a new country, signaling the dawn of a new era. The unprecedented GE14 results have obviously proved to the world that we the citizens are the masters of our own ship – we decide when and whether to repair, sink and rebuild it, let alone rock it! We should also take pride in the smooth and peaceful transfer of power. But GE14 victors should not use it to exact revenge on the vanquished in that they have received their comeuppance or take delight in their political schadenfreude. Instead, the new government’s priorities should be to restore the rule of law, redress miscarriages of justice and bring about reforms to our institutions of government. What then is the rule of law? This concept of the rule of law is also the fourth guiding principle of our Rukun Negara. To make it simple for our readers, it is best summed up in the words of Dr Thomas Fuller, who wrote in 1733, “Be you never so high, the law is above you.” In other words, no one including the king could disregard the law with impunity. As the English jurist, Henry Bracton (c. 1210 – c. 1268) put it, “the king is under no man but under God and the law because the law makes the king”. In Malaysia, the ascendancy of the law is also enshrined in Article 8 of the Federal Constitution that all persons are equal before the law and entitled to the equal protection of the law. 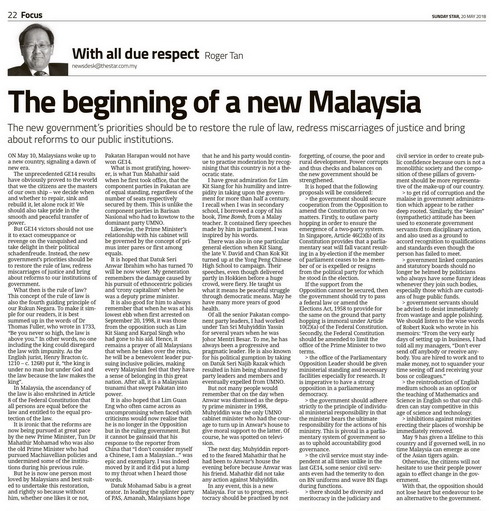 It is ironic that the reforms are now being pursued at great pace by the new Prime Minister, Tun Dr Mahathir Mohamad who was also the old Prime Minister who had pursued Machiavellian policies and undermined some of the institutions during his previous rule. But he is now one person most loved by Malaysians and best suited to undertake this restoration, and rightly so because without him, whether one likes it or not, Pakatan Harapan would not have won GE14. What is most gratifying, however, is what Tun Mahathir said when he first took office, that the component parties in Pakatan are of equal standing, regardless of the number of seats respectively secured by them. This is unlike the component parties in Barisan Nasional who had to kowtow to the dominant party UMNO. Likewise, the Prime Minister’s relationship with his cabinet will be governed by the concept of primus inter pares or first among equals. It is hoped that Datuk Seri Anwar Ibrahim who has turned 70 will be now wiser. My generation remembers the damage caused by his pursuit of ethnocentric policies and ‘crony capitalism’ when he was a deputy prime minister. It is also good for him to always remember that when he was at his lowest ebb when first arrested on September 20, 1998, it was those from the opposition such as Lim Kit Siang and Karpal Singh who had gone to his aid. Hence, it remains a prayer of all Malaysians that when he takes over the reins, he will be a benevolent leader pursuing inclusive policies, making every Malaysian feel that they have a sense of belonging in this great nation. After all, it is a Malaysian tsunami that swept Pakatan into power. It is also hoped that Lim Guan Eng who often came across as uncompromising when faced with criticisms would now realise that he is no longer in the Opposition but in the ruling government. But it cannot be gainsaid that his response to the reporter from China that “I don’t consider myself a Chinese, I am a Malaysian…” was epic and exemplary. I was indeed moved by it and it did put a lump to my throat when I heard those words. Datuk Mohamad Sabu is a great orator. In leading the splinter party of PAS, Amanah, Malaysians hope that he and his party would continue to practise moderation by recognising that this country is not a theocratic state. I have great admiration for Lim Kit Siang for his humility and intrepidity in taking upon the government for more than half a century. I recall when I was in secondary school, I borrowed a copy of his book, Time Bomb, from a Malay teacher. It contained fiery speeches made by him in parliament. I was inspired by his words. There was also in one particular general election when Kit Siang, the late V. David and Chan Kok Kit turned up at the Yong Peng Chinese High School to campaign. Their speeches, even though delivered partly in Hokkien before a huge crowd, were fiery. He taught us what it means by peaceful struggle through democratic means. May he have many more years of good health. Of all the senior Pakatan component party leaders, I had worked under Tan Sri Muhyiddin Yassin for several years when he was Johor Mentri Besar. To me, he has always been a progressive and pragmatic leader. He is also known for his political gumption by taking on Datuk Seri Najib Razak which resulted in him being shunned by party leaders and members and eventually expelled from UMNO. But not many people would remember that on the day when Anwar was dismissed as the deputy prime minister in 1998, Muhyiddin was the only UMNO cabinet minister who had the courage to turn up in Anwar’s house to give moral support to the latter. Of course, he was spotted on television. The next day, Muhyiddin reported to the feared Mahathir that he had been to Anwar’s house the evening before because Anwar was his friend. Mahathir did not take any action against Muhyiddin. In any event, this is a new Malaysia. For us to progress, meritocracy should be practised by not forgetting, of course, the poor and rural development. Power corrupts and thus checks and balances on the new government should be strengthened. > the government should secure cooperation from the Opposition to amend the Constitution on two matters. Firstly, to outlaw party hopping in order to ensure the emergence of a two-party system. In Singapore, Article 46(2)(b) of its Constitution provides that a parliamentary seat will fall vacant resulting in a by-election if the member of parliament ceases to be a member of or is expelled or resigns from the political party for which he stood in the election. If the support from the Opposition cannot be secured, then the government should try to pass a federal law or amend the Elections Act, 1958 to provide for the same on the ground that party hopping is immoral under Article 10(2)(a) of the Federal Constitution. Secondly, the Federal Constitution should be amended to limit the office of the Prime Minister to two terms. > the office of the Parliamentary Opposition Leader should be given ministerial standing and necessary facilities especially for research. It is imperative to have a strong opposition in a parliamentary democracy. > the government should adhere strictly to the principle of individual ministerial responsibility in that the minister bears the ultimate responsibility for the actions of his ministry. This is pivotal in a parliamentary system of government so as to uphold accountability and good governance. > the civil service must stay independent at all times unlike in the last GE14, some senior civil servants even had the temerity to don on BN uniforms and wave BN flags during functions. > there should be diversity and meritocracy in the judiciary and civil service in order to create public confidence because ours is not a monolithic society and the composition of these pillars of government should be more representative of the make-up of our country. > to get rid of corruption and the malaise in government administration which appear to be rather deep rooted. Similarly, the “kesian” (sympathetic) attitude has been used to exonerate government servants from disciplinary action, and also used as a ground to accord recognition to qualifications and standards even though the person has failed to meet. > government linked companies and statutory boards should no longer be helmed by politicians who always have some funny ideas whenever they join such bodies, especially those which are custodians of huge public funds. > the reintroduction of English medium schools as an option or the teaching of Mathematics and Science in English so that our children can stay competitive in this age of science and technology. > inhibitions against minorities erecting their places of worship be immediately removed. May 9 has given a lifeline to this country and if governed well, in no time Malaysia can emerge as one of the Asian tigers again. Otherwise, the citizens will not hesitate to use their people power again to effect change in the government. With that, the opposition should not lose heart but endeavour to be an alternative to the government.